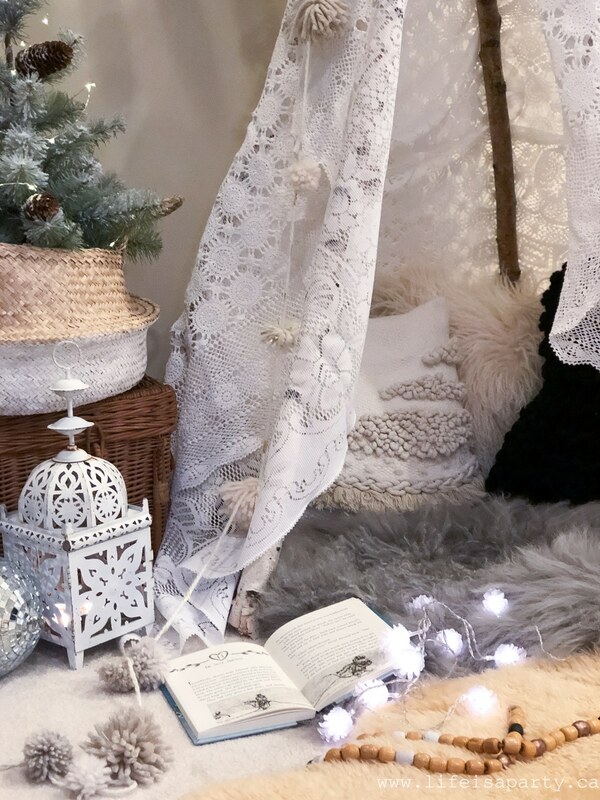 Boho Christmas Reading Tent: See how to make an inexpensive reading tent fort for kids with birch poles and an old table cloth. 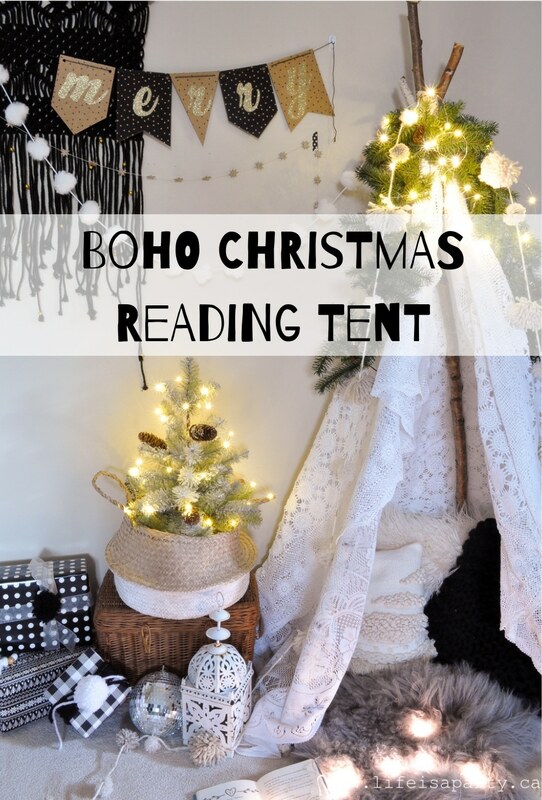 Today I’m excited to be sharing this sweet Boho Christmas Reading Tent with you. 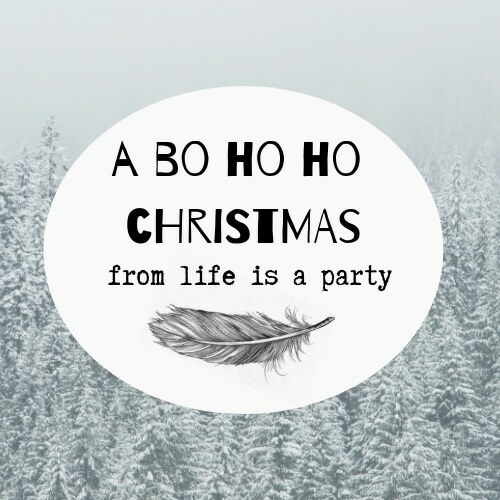 It’s the first in a week-long series of posts all about our Boho Christmas. 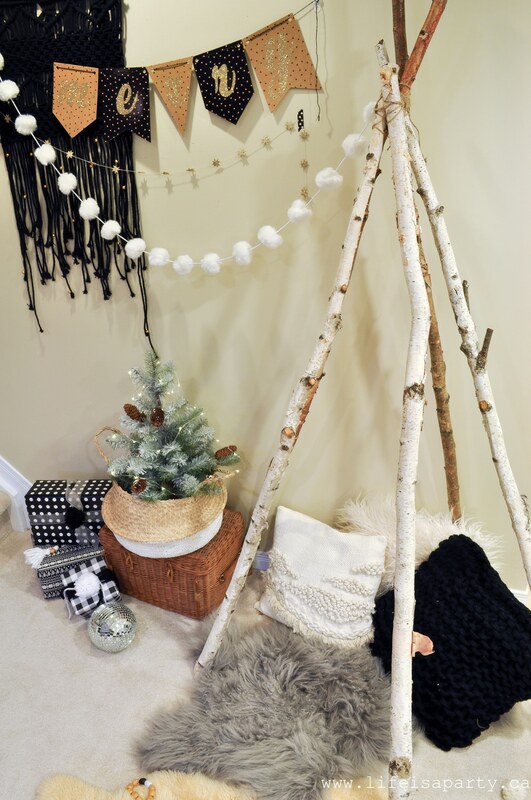 I’m decorating the basement family room with a black and white boho theme, and I thought it would be fun to share a different project each day, with the big reveal of the whole space on Friday. 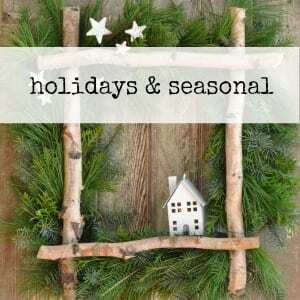 Be sure to come back each day and see another fun, and easy DIY Christmas project. 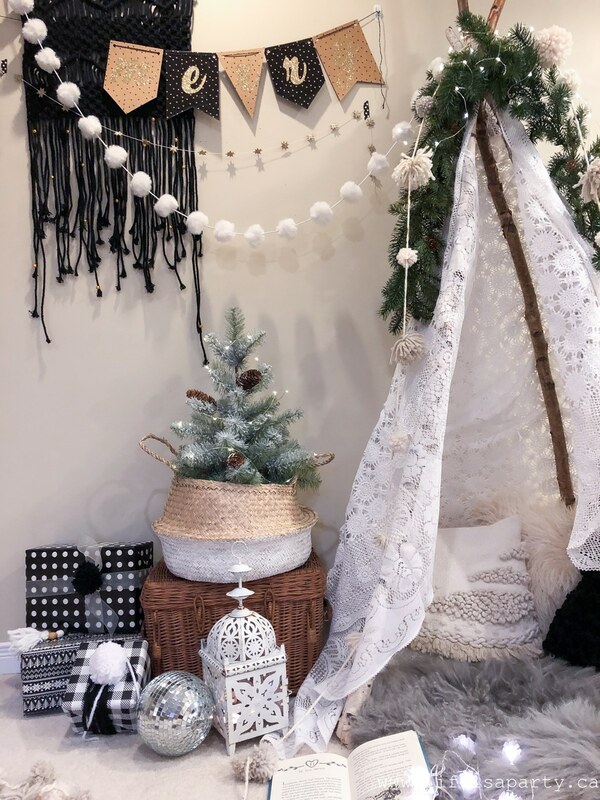 This Boho Christmas Reading Tent is a fun little play fort for my kids and their friends, and also adds so much ambience to the room. 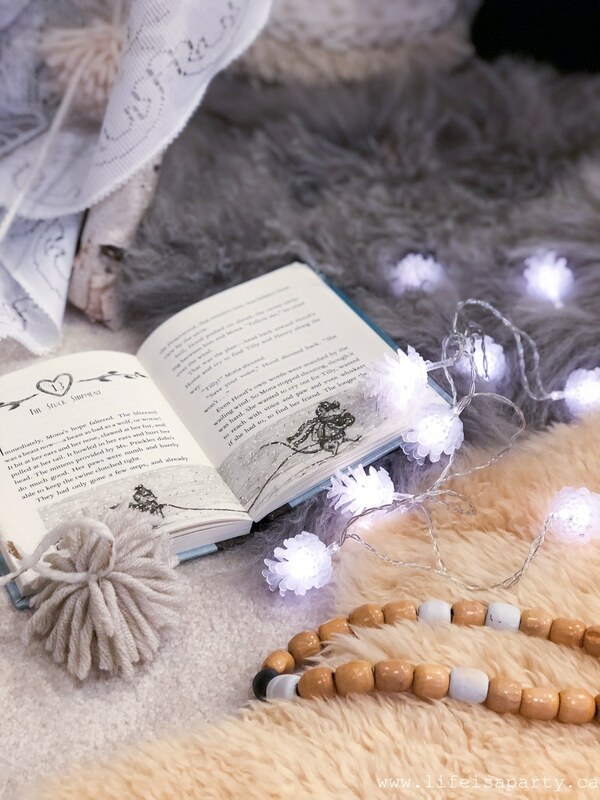 The first day it was made my youngest planted herself here with the twinkle lights and her book as soon as she got home from school and saw it. It would also be a fun spot to put some presents. My girls are just about out of the playing stage so I’m hanging on to all their final days of make-believe. It would be especially perfect for younger kids though. It was super easy to build and cost me under $5 because I had some of the stuff, and was able to forage for some. 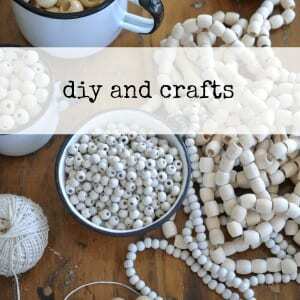 Even if you had to buy the birch poles, it’s still a pretty inexpensive project. I started out with 5 birch poles, you could use 6 to make the tent a little bit bigger if you have the space. My poles were about 6 feet. You could use shorter for a smaller tent. I cut down the poles at a friends farm, but you could also purchase -look for ones used in Christmas outdoor pots this time of year. Form a circle about 3 feet in diameter with the poles and lean them in to meet at the top and form the tent shape. Leave a larger space/opening between two poles at the front for the door. 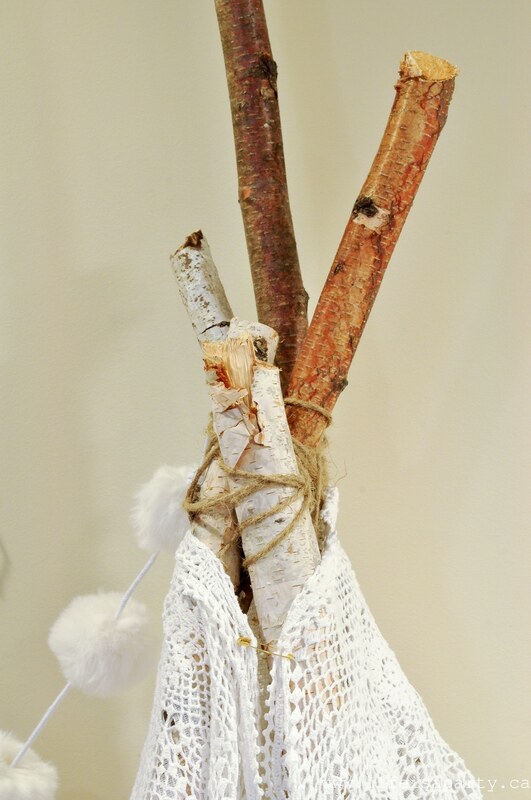 Tie the poles together tightly with twine, taking care to loop around the poles and make them very secure. 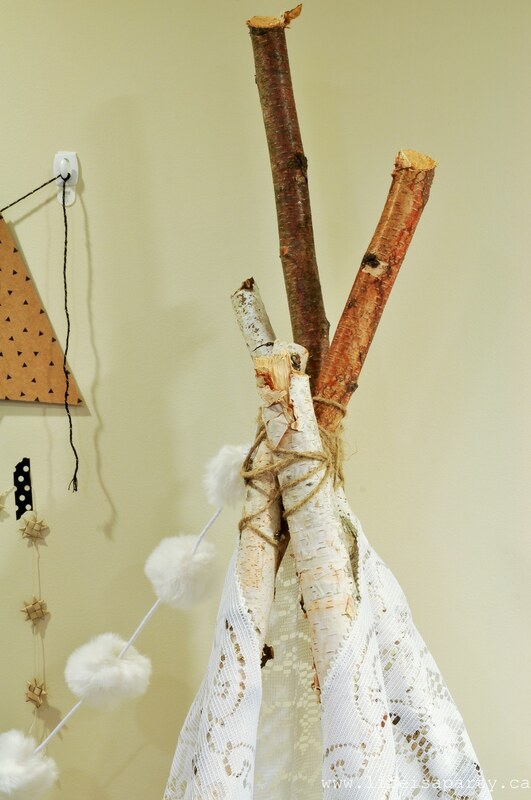 If your children are younger, or more active you might want to pre-drill a hole through each pole at the top and thread the twine through the holes to make it even more stable. 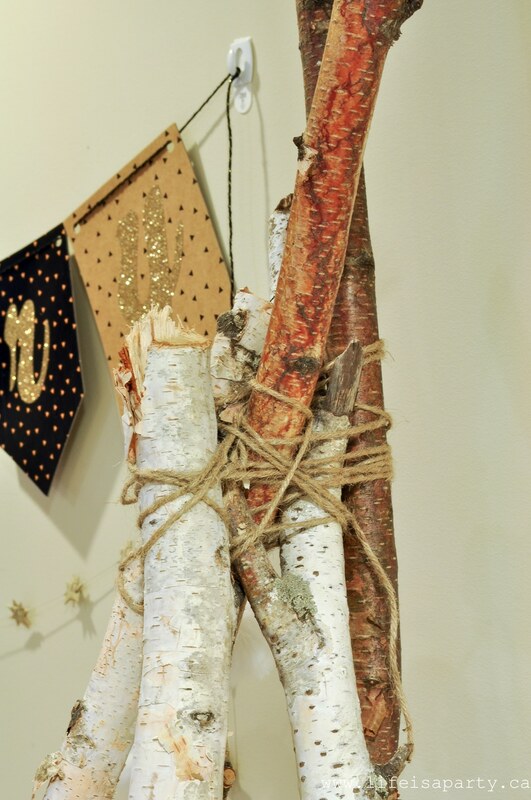 Note that birch poles are a little heavier than dowel which these tents are often made of, so you want to take extra care to make sure it’s secure so a little one is never hurt from the poles falling. Once the poles are all tied together, it’s time to add the tablecloths. 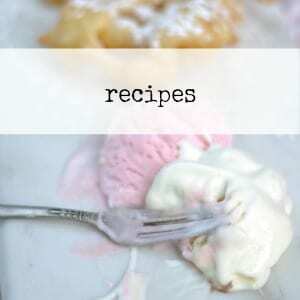 I used two and layered them. One was an old one I had, and the other I picked up for under five dollars at the thrift store. One table cloth wasn’t quite big enough to wrap around my tent, so I used two layered together. It’s really easy to get the tablecloths in place because the rough bark catches easily on the lace. Secure the top with a simple safety pin. Finish the tent by tucking the tablecloth sides in around the bottom of the tent and fold back the front flap to form the door. Now the fun part, add lots of soft cushions and sheepskin rugs, or throws inside. 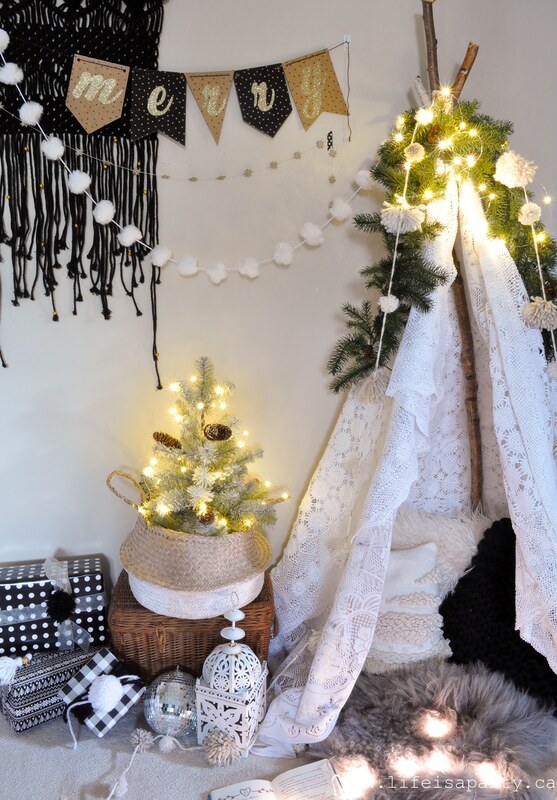 To decorate your tent wrap the top with Christmas garland, fairy lights, and pom pom garland. 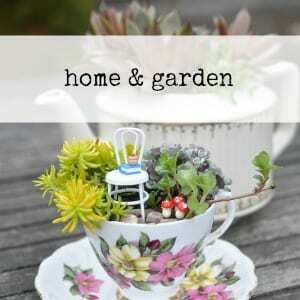 Some artificial flowers might be a fun touch too. You could also add a stack of new Christmas books -the thrift store is a great place to find these really inexpensively. I had so much fun decorating this little space. To make if feel even more boho, I added a fun macrame hanging to the wall. I sewed little gold bells onto it to make it feel a little more Christmas-y. 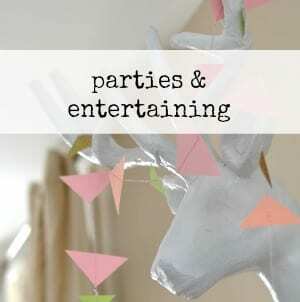 I wanted to add lots of garland and bunting to create a layered look. I used simple washi tape, and 3M Hooks for the heavier one to attach them to the wall in a non-permanent way. 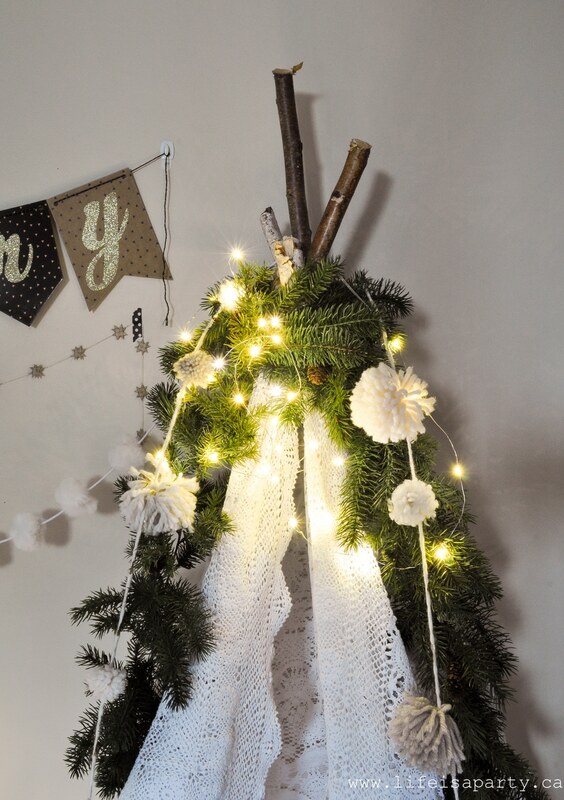 The pom pom garland is a fun addition from my trip to Target. 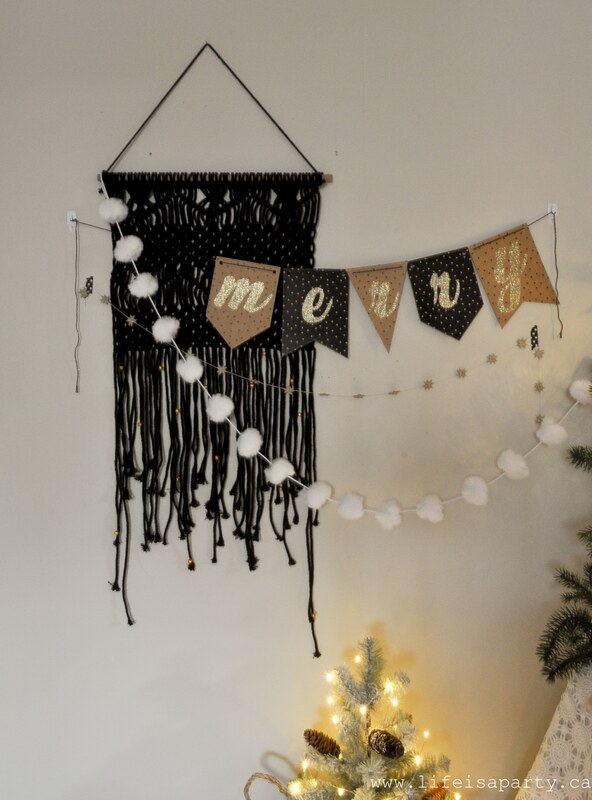 The “merry” banner is one I made on my Cricut machine. There’s also a garland of little straw stars. Boho decor tends to include a global influence so this, and the Moroccan lantern are great additions to achieve the look. 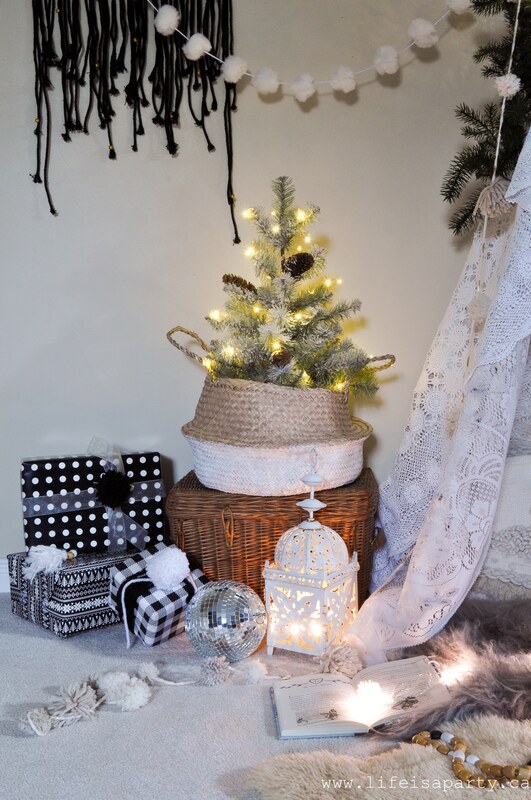 This little Christmas tree in the basket looks great with some twinkle lights. There’s also a few presents layered in, and disco ball for fun. I love the eclectic layered look of boho design. It’s also great to include some natural elements like the wicker, and the wood beads for this look. 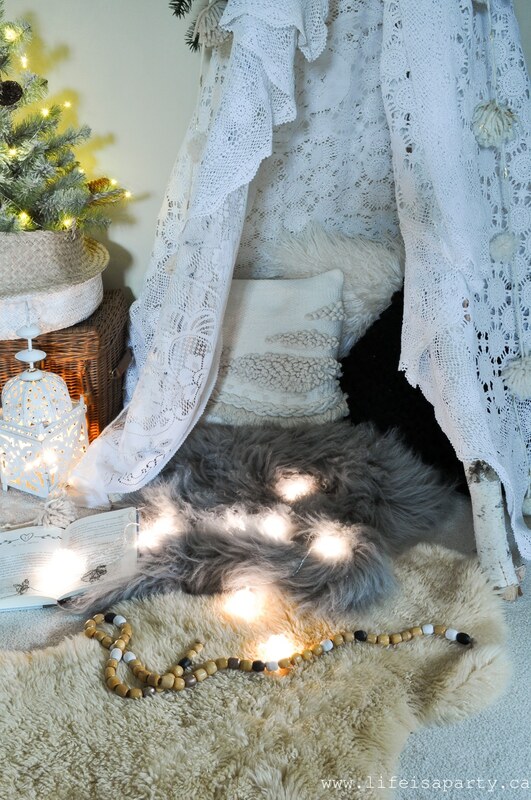 I’ll be sharing lots of tips on how to achieve the boho feel for Christmas all week. 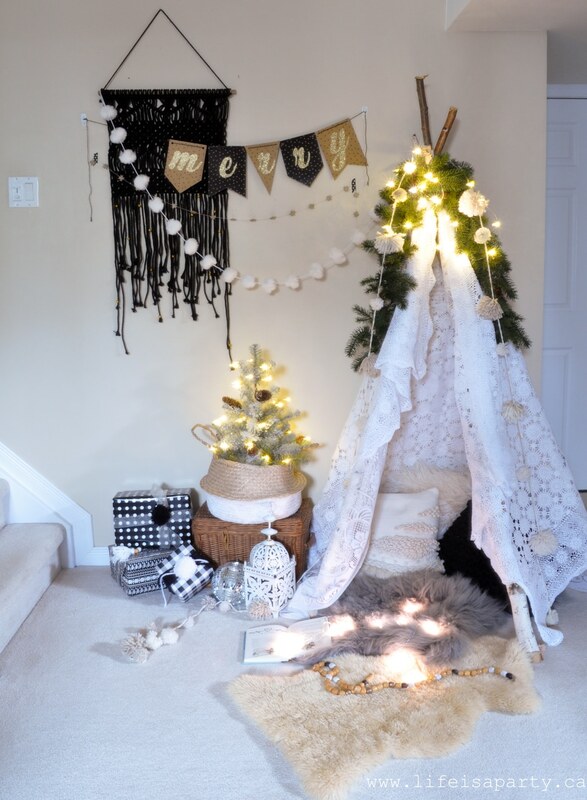 With a fun little Boho Reading Tent to enjoy over the holidays, life really is a party!